What we seem to have here is a B movie version of a comic which was itself nothing but a comic book version of a B movie. It’s exactly what you expect from the title. As long as you think small, that is. It’s a regional film — no big Hollywood talent. And it’s cheap and has zombies. The fun part is, these are zombies that haven’t changed much; they aren’t much worse characters in flesh-eating undead form than they were when they were alive. It’s a horror-comedy. The humor is pretty subtle in the first half, and intermittent in the second. The gore is not. The unrated version is seriously gruesome. There are some hideous atrocities on screen here, with some pretty good quality rubber effects. No prize for guessing which girl is final. It’s got rocknroll. 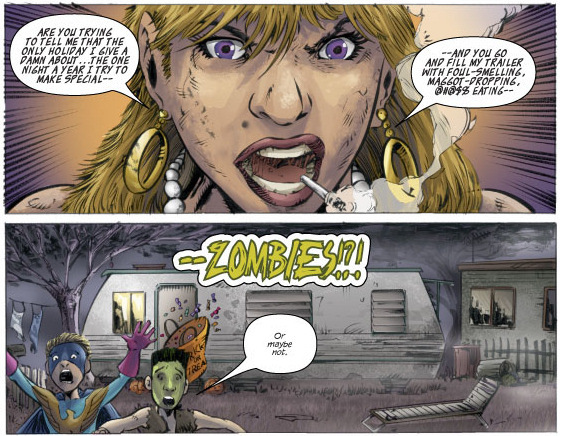 There’s a zombie who likes to play electric guitar on the roof of his trailer, and when he gets a good lick going he’s accompanied by invisible bass and drums. Coulda been a lot worse. Not bad entertainment. In fact, pretty darn fun... at least if you can stomach more gore than I care for. I guess who this movie is really meant for is people who can find the gore itself to be fun. Which ain’t me. But I can enjoy the rest of it. Most fun is the top-billed Nichole Hiltz, who is sort of the Sheri Moon Zombie of the picture. Only funnier. She’s the one who brings the zombie curse down on the trailer park, and then ends up being the charming hostess who welcomes the park’s unlucky visitors. She’s a scene-stealer. It’s kind of surprising that this movie even has any comic book connection. It just seems like exactly the kind of movie a clever small-time regional filmmaker would come up with on his own.